WHERE IS PAUL RYAN AND WHY IS HE NOT CALLING FOR THIS VIOLENT PLAY TO BE SCRAPPED? In December 2015, Paul Ryan rushed to the podium and angrily condemned then presidential candidate Donald Trump and his call for a Muslim ban in the wake of attacks in Paris and San Bernadino. Ryan told House Republicans that presidential candidate Donald Trump’s comments on Muslims is “not who we are” as a party or as Americans. On Thursday Republican Representative Steve Scalise, the House Majority Whip, and two Capitol Police were shot during baseball practice on Wednesday morning. Hodgkinson asked lawmakers, “Are those Republicans or Democrats?” before gunning down Rep. Scalise and his security detail. 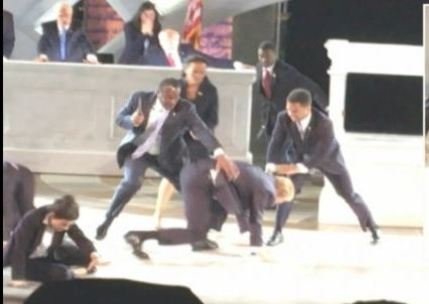 Currently there is a play running in New York City Central Park that includes a Donald Trump ASSASSINATION SCENE!! As of this post, Paul Ryan HAS NOT condemned the Trump assassination play! WHERE THE HELL IS PAUL RYAN? ?